Clinicians - Work With Us! 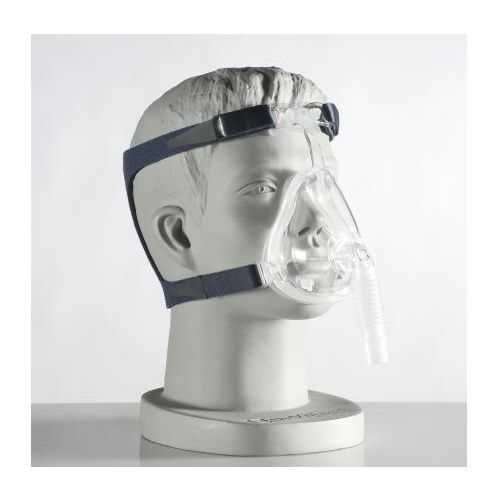 The DeVilbiss D100 Full Face Cushion is a spare part (cushion) for the DeVilbiss D100 Full Face CPAP Mask With Headgear. The cushion is a moulded silicone cushion that is lightweight and comfortable to wear. Well-fitting masks increase the compliance of treatment and the overall effectiveness in the improvement of Sleep Apnoea symptoms. Your mask (and all parts) should be cleaned after every use. To clean, simply detach the headgear and clean the mask components with warm water and mild detergent. Rinse all components thoroughly and leave to air dry. The D100 mask frame can be cleaned in the top rack of the dishwasher. Lightweight and comfortable to wear, the D100 Series of CPAP masks offer cost effective flexibility and comfort to the wearer. If you have any questions about the D100 Series of CPAP masks. Do you have a question about this product or would you like to purchase it? No problem at all. Simply call us on 020 7720 2266 between 09:00am and 5:00pm, Monday to Friday. It's completely free and we'll always keep your details private. We're happy to answer any questions, so just give us a call. 9.00am to 5.00pm, Monday to Friday. At all other times please leave us a message and we'll get back to you during regular office hours. Alternatively, you can email us and we'll answer your query as quickly and as thoroughly as possible. Copyright © 2019 Sleep Apnoea Services Ltd. Registered office: 67 Chorley Old Road, Bolton, BL1 3AJ. Registered in England. Reg no. 9534593. All rights reserved. Copyright © 2019 Sleep Apnoea Services Ltd. All rights reserved. Registered office: 67 Chorley Old Road, Bolton, BL1 3AJ. Registered in England. Reg no. 9534593. Information contained on this website or provided by our team is for reference purposes only and does not constitute medical advice or medical opinion. We always recommend consulting a qualified healthcare professional for diagnosis and treatment. Basic InformationWhat is Sleep Apnoea?What causes Sleep Apnoea?Symptoms & DiagnosisHow we can helpClinicians - Work with us!